BT has confirmed how fans will be able to watch the finals of the UEFA Champions League for free. Free access to the finals will be available to Freeview HD viewers via BT Sport Showcase HD (subject to local coverage), through BT TV, Virgin Media and Sky from 6pm on 3rd June. Details and channel numbers are listed below. Beyond traditional platforms, the game will be live on BT Sport’s YouTube channel at www.youtube.com/btsport; www.bt.com and the BT Sport App. BT will deploy the latest technology to bring coverage, including 4K UHD coverage on YouTube and 4K UHD with Dolby Atmos Sound on BT TV. 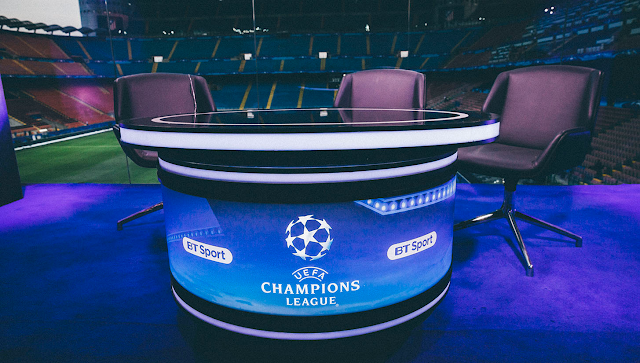 For the first time ever the UEFA Champions League final will also be available through a number of 360°streams on YouTube and the new BT Sport Virtual Reality App, allowing viewers to choose between a 360°produced programme with commentary and graphics, or select their own camera viewpoint. Saturday 3rd June 2017, from 6pm, live from Cardiff. Kick off 7:45pm. 4K UHD access requires a superfast broadband connection. * BT Sport Showcase HD's signal is now only available to around 75% of UK households. Viewers are required to have a Freeview HD compatible device. The previous service on Freeview channel 59 has been turned off. More on this recent technical change to the BT Showcase service is available here... Freesat viewers with the newest connected receivers can access coverage via the in-built YouTube app.